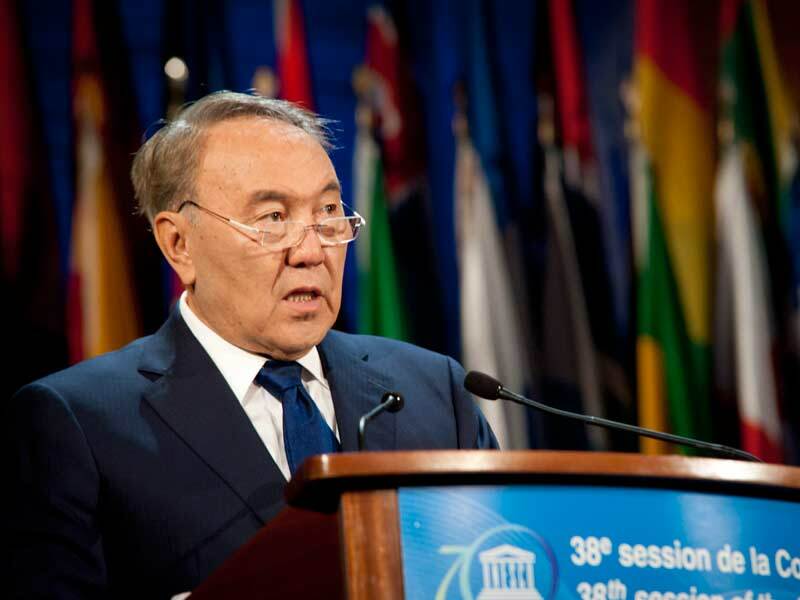 Nursultan Nazarbayev, President of the Republic of Kazakhstan, today addressed the 38th session of UNESCO’s General Conference, the Organization’s governing body, on the occasion of its 70th anniversary. In responding to the threat to violent extremism, the President declared: “It is important that our collective efforts in countering Islamic radicalism do not confuse this distorted extremism with peaceful Islam. We can best counter extremism through inter-cultural and inter-religious dialogue,” he argued. In this light, the President informed about the proposal to establish a “Forum for Islam against Terrorism” in Kazakhstan. He also presented several new initiatives to scale up his country’s engagement in addressing global challenges, notably the establishment of an “Academy of Peace” under UNESCO auspices. He also invited UNESCO to have its own pavilion at the Astana Expo 2017 on Future Energy. The President shared the Director-General’s vision that education is a key in preventing youth radicalization and countering violent extremism. He suggested that all countries should reallocate a proportion of defense spending to education. The Director-General underscored Kazakhstan’s important contribution, in advancing the Organization’s objectives, notably through extra-budgetary programmes, and the country’s commitment to bolster regional and international cooperation. Ms Bokova particularly welcomed Kazakhstan’s leadership in the proclamation of the International Decade for the Rapprochement of Cultures (2013-2022), for which UNESCO has been designated as the lead United Nations agency and praised the country for promoting the values of cultural pluralism, tolerance and inter-religious dialogue. The President was accompanied by Deputy Prime-Minister Dariga Nazarbayeva and Foreign Affairs Minister Erlan Idrissov, as well as Education and Science Minister Aslan Sarinzhipov, along with Ambassador Nurlan Danenov, Permanent Delegate of Kazakhstan to UNESCO.